It’s time to sew!! 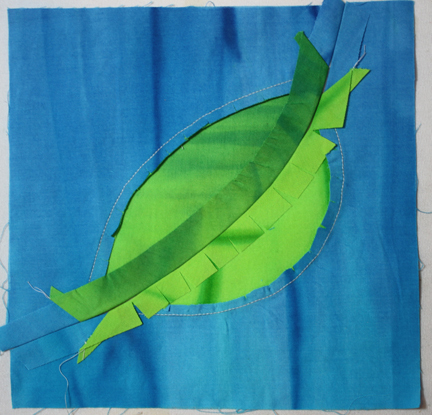 Once you have all of the leaf sections lightly glued to the background pieces, it’s time to sew them together. This is why you leave a 1/2″ seam allowance so when you go to sew the pieces you have a large margin to hold onto while you sew and turn the leaf and background sections. I have found that I want to sew these pieces together with the concave side, that would be the background side, facing up. This allows the convex side, the leaf, not to stretch very much. Once I remove the paper from both sides of the pattern, I am going to use the line I traced as a guide and sew right on that line, stretching and turning the pattern as I go. I might even use a stiletto or seam ripper to hold the seam down while I am stitching it. When I stitch the seam I want to make sure I stitch all the way to the edges. Once I finish stitching the seam I will turn it over to make sure I didn’t create any puckers. If I did I will pick them out and stitch it again. Then I will pull apart the glued seam and press the seam allowance flat. 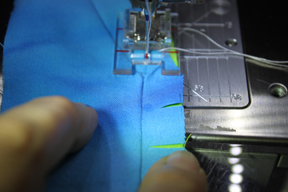 I will trim it to a 1/4″ after I pull the seam apart. I also want to make a small V cut at the next seam line, this will decrease bulk when I sew the two sides of the pattern together. 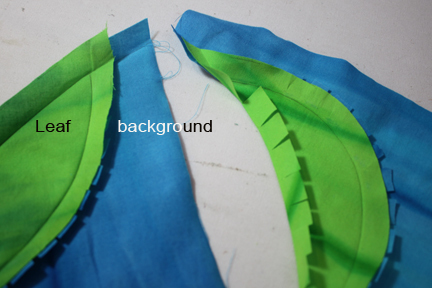 I will follow the same procedure of gluing to join the center seam and then sew the two halves together. 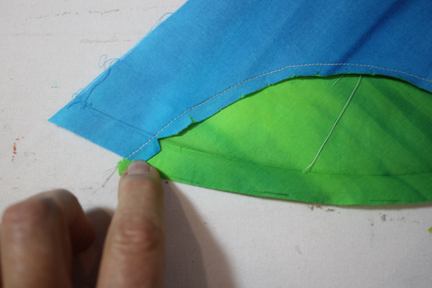 I like to press the center seam of this design open when I am finished, it makes the finished product lie flatter. Once the two sides are together, I will add batting and backing and quilt the little square. Once that is done I will square up the mug rug and add a binding to it. 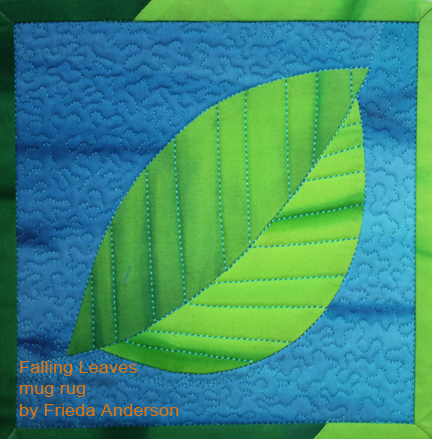 Now I can make this one leaf design into a charming MUG RUG to use with my morning coffee or tea. I hope you give this technique a try and when you do I know you will want to make the larger version of this design – FALLING LEAVES for your wall or table. I hope that I see some of you at the upcoming IQF show in Houston, TX in a few weeks. Laura Wasilowski and I will have our booth again this year – ARTFABRIK/FrieStyle #914 with lots of hand dyed fabric, thread and fusible patterns. This pattern Falling Leaves which is a PIECED pattern will debut there. Coming on by and see us and get this great pattern with either the green or blue fabric kit. I like the pieced look. Very pleasing! Thanks Diane, I do too.